I wanted to compare mental ray, vray, and scanline rendering engines all together to see what the strengths of each were as well as the weaknesses. 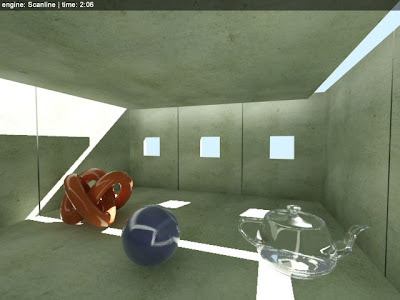 The following images were all created in Max 2008. There can be a lot of discrepancy between the different engines because they support different shaders, lights, and rendering algorithms. But I wanted to get a quick approach comparison. So I didn’t spend a lot of time with the lights or the shaders, and I thought this approach would show best what the strengths/weaknesses of each were. I used the same scene with 1 light. 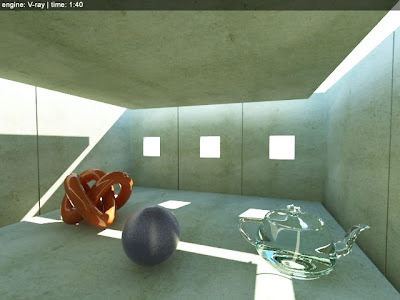 Daylight system for mental ray and scanline, and VRaySun for vray. But they were all located in the same place. This first image is the scanline rendering. I hardly ever use scanline anymore, but I’m continually amazed at how fast it renders certain elements. For the walls of the room I used the Standard shader, and for everything else I used the Raytrace shader. Again I didn’t spend much time tweeking the shaders so the rendering shows what they look like almost out-of-the-box. I used Radiosity for my Advanced Lighting. One thing that gets lost in the rendering is the detail in the corners of the wall. Unless I crank up my radiosity settings, there is no ambient occlusion as in mental ray or vray. The torus knot turned out quite nice with it’s reflection. It has the raytrayce shader with a pure reflection of 1.0 and a fresnel falloff. The blue sphere also has the same shader only I tweeked the Raytrace Reflection and Refraction Antialiaser locally just for the shader. I played with the Blur / Defocus settings to get a scattered brushed metal look. The results are very disappointing and very slow. This is also why the rendering took 2min 6 sec to render. My understanding is that scanline takes the raytrace image and offsets it multiple times to get a “scattered” look. The raytracing in the Utah teapot is also very disappointing and looks fake. I could have spent more time with this shader and made it look decent but I wanted a quick out-of-the-box result. It is using a fake specular, and doesn’t know hot to take in account thickness of glass. So it has a very bubble-wrap look. One more thing to not with scanline is it doesn’t have any gradient environment maps that link to the sun like mental ray or vray. One thing that scanline is super-fast and good with is rendering volume light, and atmosphere fog. I still use scanline for this and end up compositing it onto my mental ray / vray renderings. Immediately with vray one big plus I notice from scanline is the light bouncing. There is a very nice blue color bleeding on the walls from the sky, which emulates the over-exposed sky look of an interior shot. There is also much better light detail around the corners of the room. Now you can actually tell that the floor drops before it hits the walls (For this image I used irradiance map for the primary bounce and light cache for the secondary bounce). 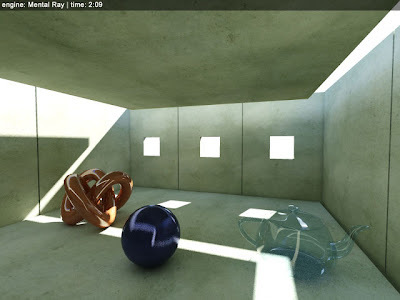 One big big plus for vray is the raytracing. For the whole scene I used the regular VRayMtl. The torus knot doesn’t look too different from scanline, but that was because this shader doesn’t have any reflective scattering, or Refllective Glossiness as vray likes to call it. But when you look at the blue sphere, it handles reflective scattering much much better than scanline. In fact, in this image, the ray was only scattered 8 times, and still looks decent. I was also quite impressed with the refractive qualities of the teapot, and it’s really doing some great things. It has a thickness as well as color bleeding from the glass color. Of all 3, vray had the fastest rendering time of 1min 40sec. Very impressive! Last but not least we have mental ray. The biggest win for this engine is the ambient occlusion. Good job mental images! There are some wonderful falloff shadows under every object, and it gives true weight to the objects in the scene. The little details like the control joints in the wall are best in this engine. Much like vray, there is also some color bleeding from the sky onto the walls. Not as much, but it seems to look more physically accurate in my opinion. One thing that is difficult to control in mental ray however is color from the shader to the final render. Of course it depends on your exposure settings, but I found that using mr Photographic Exposure Control tends to washout the color more than Logarithmic Exposure. I still like the former, because I can control my light settings like a real camera. I managed to tweek the colors very quickly, and even though they aren’t exactly the same as scanline or vray, they still show their reflective and refractive properties. I ended up using the Arch & Design shader for this scene, and it has some really nice bells and whistles. The torus knot doesn’t do anything very different from the other engines, but I noticed that the blue sphere’s reflection, although it is scattered, looked much more similar to scanline….interesting. It’s scattering is much better than scanline, but I found that it is much more difficult to control than vrays, and needs a lot of Glossy Samples to keep the noise minimal, there are other ways to fix this, but I don’t want to get into it at this time. The refractive properties in the glass pot are nice too. Unfortunately I rendered this shader with Thin-walled instead of Solid, and I don’t have the scene anymore to change it so looks very different from vray even though it could have had very similar results. So thickness aside, I like a lot of the things it does with color in the refraction. Final verdict: scanline has bit the dust for the beauty pass…but it’s still useful for certain passes. Vray is very fast at scattering reflection and refraction, however it has to have very high samples for anti-ailiasing. Mental ray is very good at soft shadows / ambient occlusion, but not quite as fast at scattering reflection as vray. My current preference right now is mental ray. The Arch & Design shader is very powerful, and I like controlling my exposure not from the camera (the way vray does) but from a global setting, because if I have several cameras in one scene, then they will all capture light the same, even if they are keyed to move differently. Also distributed rendering with mental ray from my experience is much more stable than vray. But the big big plus is that mental ray comes free with Max 2008! "it just that the "national museum" challenge is not getting better result with mental ray...vray result on the other hand are pretty good"
Might have a lot to do with the fact that in most schools architectural rendering is taught with Vray, so theres a lot of talented people out there that know how to handle Vray flwalessly, in contrast to mental ray, where there isn't as many power users. Thanks for the information Mr Ramy, may i know those of your portfolio were rendered by what engine? mental or vray? And is it possible by using raytrace with vray for rendering? i know it is a long shot, but do you still have the scenes for these files. if so, can you put them online for download. i really need a set of 3 scenes like this to test stuff in the various render engines. I've looked for the file, and I do not have it...apologies. hi brother ...,I'm in Indonesia now. i'm work in consultant design and animation,so ..i like using 3 engine in different situation. sometimes we must to know 'when'to use it,because they're 've many advantages in others. and I like that's all. thanks for your information .... good job. Hi Ramy... Very Informative, thanks... How long did the MentalRay render take?